Blogger provides many features among which template customization is very useful. It lets you to customize everything in your blog such as changing colors, customizing images, links, adding css codes etc. You can make your blog look beautiful by using these customization tools. (1). Go to blogger, log-in to your blogger account and click template. (2). Click customize, it will redirect you to customization page. The first option is templates, here you can change the template of your blog the default template is simple, you can change it to dynamic,picture view, awesome inc and so on. To change the template click desired template and on the top-right of the page click Apply to blog. 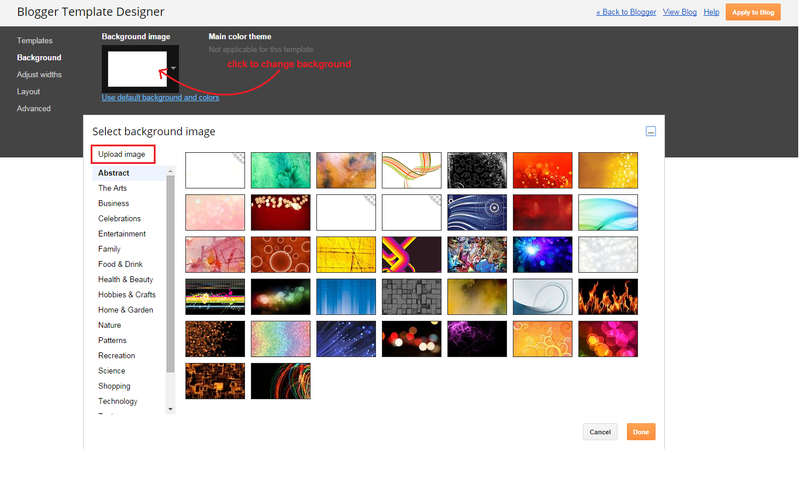 This option lets you to change the background color of your blog. You can also add an image in background. Click the color which you want to set. To upload image in background click background image, a pop-up will open which contains images provided by blogger you can also set them as background images but if you want to set a custom image click upload image and choose the image which you want to set in background. Adjust width lets you to change the width of your blog. You can increase or decrease width of whole blog or only right bar. If you increase your blog width too much click reset widths to template default to reset it. It lets you to change the pattern of your blog layout. You can change the layout of the whole blog or only footer. There are three types of footers which are single gadget footer, double gadget footer and triple gadget footer(having three free spaces for gadgets). To change layout select the layout either for the whole body or footer and click Apply to blog on the top-right of the customization page. This option has many sun-options such as page text, backgrounds, links, blog title, blog description, tabs text, tabs backgrounds, post title, date header etc. With page text you can change font and color of text of whole blog, with backgrounds you can change the color of the header, outer and main background, with links you can change the color of active links, hover links and clicked links, with blog title you can change the font of blog title along with its color, blog description lets you to change the color of your blog description, tabs text lets you to change the color of active text and selected text(in tabs) and Add css option lets you to add any css code of gadgets. I hope this was helpful to you. If you have any problem regarding this post ask me in comments. share this post with others. Follow and subscribe for updates. 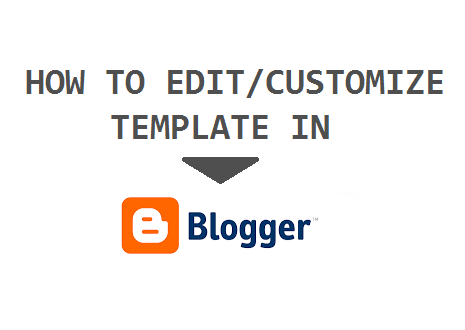 Tags: How to customize template in blogger, 101helper, blogger template customization, customize blogger template.